Display your favourite plants in style with this silver-coloured planter. Perfect for bulbs, bedding, shrubs, houseplants and more, this wonderful black planter with a brushed silver finish will add an exquisite decorative look to your home or garden. Hand finished in silver paint, with a wicker effect, it will add a touch of class to your home or garden. Raised drainage holes and water reservoirs to allow your plants to thrive! Made from heavy-duty injection moulded plastic, it's tough & durable, and also frost & UV resistant, so can be reused season after season. 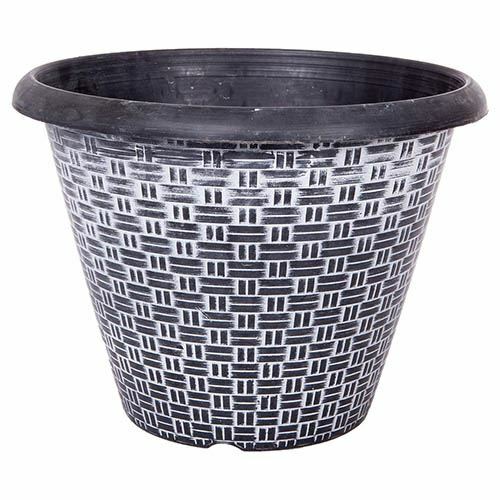 Supplied as a single 30cm (12in) diameter planter. Perfect for bulbs, bedding, shrubs, houseplants and more, this wonderful black planter with a brushed silver finish will add an exquisite decorative look to your home or garden, without the cost of a real metal pot. Hand finished in silver paint, in a ‘wicker’ style effect, it will add a touch of class to your home or garden. Complete with raised drainage holes and water reservoirs to allow your plants to thrive! Made from heavy-duty injection moulded plastic, it's tough & durable, and also frost & UV resistant, so it'll withstand the worst of our British weather too. This planter represents great value especially when compared to normal prices for metallic or ceramic pots, yet you get a timeless and classic look!